Bass clarinet, clarinet, whistles, MIDI sax and AudioMulching by Brigid Burke. Computer sound generation and processing in Beads (www.beadsproject.net) by Ollie Bown. Artwork painting and photography by Brigid Burke. Puff and glitch samples on "The Spasms of Clark Nova" by Lothar Ohlmeier. Gamelan and drum sounds by Adrian Sherriff and Jeremy Dullard. Thanks to Ben Porter for contributions to the Beads library. 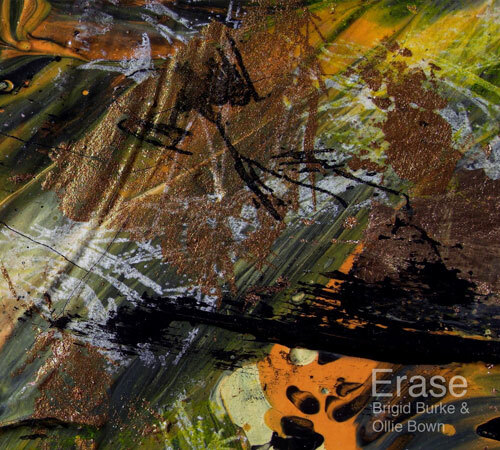 Erase is the first release from a collaboration between Ollie Bown and Brigid Burke. Ollie Bown is a British electronic musician and programmer working with generative and interactive music software. Brigid Burke is an Australian clarinet and bass clarinet player who performs in new and improvised music ensembles and also works with generative video. After a chance meeting in Melborune, Ollie and Brigid began improvising together, finding freedom in the harmony between their playing styles and musical ideas. The album Erase is a record of their musical collaboration over a short period in 2009 in Melbourne, in the form of live performance and edited material. It is a hotch-potch of simple textures, bursts of glitch, squawks, whoops and duck whistles, mashed up gamelan, scattergun drums, and hacked MIDI sax. Erase is sparse, with gestural outbursts from the clarinet provoking fluctuations in what might otherwise be a repetative electronic layer towards momentary jolts of activity.